Welcome to the Russian Room. For this update I am placing a number of fine specimens online including tourmalines from Malkhan, topaz, sphenes, sphalerites, fluorites and galena. I have included specimens from Kazakhstan also in this update. To learn more about Russia here are a couple of very good websites with photos and info! Click here for geographic info on Russia. Click here for an outstanding set of photos and info on the mountains of Russia! 8 x 6.5 x 5 cm specimen hosting dozens of lustrous bipyramidal crystals of zircon to 1.1 cm across. Under SW UV light the crystals fluoresce a bright yellow color. No damage to any of the crystals on this specimen! 4.5 x 3.5 x 2 cm specimen of crystallized quartz hosting two crystals of sharply crystallized bornite. The large crystal is 1.3 cm across. 6.8 x 3.5 x 2.5 cm specimen of crystallized calcite hosting a few crystals of root beer colored sphene to 1.4 cm in length. 7.5 x 5.5 x 2.5 cm specimen of crystallized calcite hosting a few crystals of root beer colored sphene to 1.8 cm in length. 5.7 x 4 x 3.3 cm specimen hosting a group of intergrown very light blue topaz crystals. The largest crystal is 2.7 cm in length. The matrix consists of quartz. 4 x 3.1 x 3 cm specimen of stunning ice blue (untreated) topaz. The crystal is actually doubly terminated having a simple pincoid with pyramidal modifications on one end and a complex etched termination on the other. No damage to this fine crystal at all. There are some small attached crystals of muscovite on the sides of the crystal. 3.8 x 2.2 x 2 cm cluster of gemmy sphalerite crystals. The largest of the crystals is 2.6 cm across. 5 x 4.3 x 4 cm specimen of octahedral fluorite with attached muscovite and minute crystals of cassiterite. The crystal is completely and doubly terminated without any damage. 4.6 x 2.5 x 1 cm sawn specimen of black chromite rich matrix hosting a druse of rich pine green crystals of uvarovite to 2-3 mm across. 6 x 2.3 x 0.7 cm sawn specimen of black chromite rich matrix hosting a number of gemmy deep green colored crystals of uvarovite to 2 mm across. Also present are acicular crystals of Shuiskite - a chrome rich silicate species. The TN picture to the left has both the Shuiskite and Uvarovite crystals present. 1.1 x 1.1 x 0.6 cm fully terminated crystal of icey blue kovdorskite. Guess where this specimen gets its name? 7.5 x 3.7 x 3.5 cm fully terminated crystal of quartz hosting a group of color zoned fluorite crystals to 2.3 cm across. The fluorite crystals have phantoms preserving the crystals former habit of octahedron and dodecahedron morphology. Also present are crystals of chalcopyrite and minute crystals of scheelite to about 0.5 mm across. 12 x 7 x 5.5 cm specimen hosting a couple dozen or so crystals of galena 1.3 cm across. Also present are crystals of jet black sphalerite and brass colored pyrrhotite. 8.5 x 3.5 x 0.7 cm sawn specimen of charoite with tinaksite and an unknown black mineral. This mineral is a product of metaporhism as evidenced by the wavy textures. 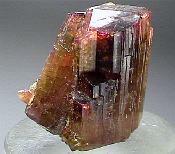 3.3 x 2.5 cm intergrown specimen of elbaite. The two intergrown crystals are terminated with pinacoids modifiied by pyramidal faces. 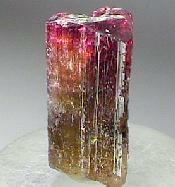 2.7 x 1.5 cm fully terminated crystal of bi-colored elbaite. The crystal is fully terminated but has a grove half way up the prism on the back side where a smaller perpindicular growing crystal stopped further devlopment of this crystal. It left a distinct gap reaching to the center of the crystal where the prism wall extend upward and .truncated by the termination. 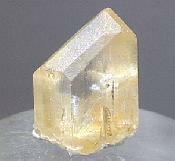 Sharp 2.4 x 1.5 cm honey colored crystal of danburite. This crystal has a damage free termination. 2.8 x 1.7 cm specimen of quartz matrix hosting a 1.5 cm crystal of lustrous rutile.